Scivation Xtend needs no introduction. This is one of the best selling Amino product in the market as well as the best selling Intra Workout in the market. The guys at Scivation know what they’re doing, just as you can see in my previous Scivation quake review. This product, like other similar products from this category, is supposed to help with keeping you hydrated and keep muscle protein synthesis with BCAA research, which I know some of you to buy into, but let’s dive into the Scivation Xtend RTD Review. 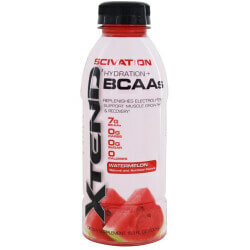 Scivation Xtend RTD brings 7 grams of BCAA with 0 carbs, 0 calories, sugar, and an electrolytes bland of almost 1 gram which includes potassium, sodium, and a couple of other ingredients you would expect in such products. It also has 1 gram of 1:1 ratio Citrulline Malate. The idea behind it is obviously not to get you pumped with 1 gram, but rather to expand your vessels and get more nutrients to your blood to help you keep going longer. So this product is positioned in the Intra Workout market, just like the original Xtend, but what I like about it is that it’s in an RTD form, which is like a Gatorade replacement with zero calories, plus 7 grams BCAA, plus the Citrulline Malate and the electrolytes. So you could use it in the gym, you can use it for cardio, you can use it outside of the gym to get your muscle protein synthesis going and get your hydration in place. So, the idea is a good “on-the-go” idea which I totally get the concept for, unlike other RTD products coming out to the market these days. Having said that, I would like the bottle to be bigger, rather than the 500mg it is. So, if you are into the Intra Workout concept and you like RTD, I totally recommend it. Is it deserving of entering the Best 10 Intra Workout Supplements? You will have to find out. If you compare this to a 30 servings Salvation Xtend, retail price (without looking for Scivation Xtend RTD Best Price through our price comparison) is about $20 for 30 servings, which makes this product on par with the other BCAA Amino RTD’s. I got the Watermelon flavor and kept it in the fridge overnight. The taste is good – it surely tastes like watermelon, but a very sweet one to my liking. I would probably add water once I had a few sips. There’s a bit of an aftertaste but nothing too dramatic, and it definitely tastes like a good Intra Workout BCAA. The use cases for this would be going to the gym, going for a long walk, going for fasted cardio and wanting to take some BCAA with you (even though I know some researches show BCAA breaks the fast), but generally speaking I totally get it. If you offered me this versus Gatorade, price aside, I would definitely go for this just from a profile perspective. It’s already cold, ready for drinking right out of the fridge, and doesn’t require any powders or mixing. I dig it.